Journey is one of the most beautiful games this year, one that I really enjoyed playing. It's quite an experience journeying through the haunting landscape, ancient ruins while listening to the enchanting soundtrack. This artbook is a great companion for the game. It's a 188-page hardcover with nice paper. The art and illustrations are created by Matthew Nava who's the art director at thatgamecompany. He's also the one who art directed the earlier game Flower. Collected within the book are the concept art for the game with character and creature designs, environment paintings, architecture designs, and even a section on fan art. There's lots of commentary throughout. The art is as beautiful as the game itself, of course. But with the book you get to see more such as the discarded concepts, e.g. the evolution of the main character design from a more realistic to a stylistic one, unused buildings, locations, etc. The architecture designs are wonderful, with influence from Greek, Islamic and Japanese blended with mystery and an otherworldly feeling. It's interesting to study the use of colours in the game which has a very limited palette and yet can look so good. One unique feature of the book is its use of Augmented Reality (AR) technology. It's one where you scan the pages with your mobile phone or tablet camera and a virtual reality 3D image pops up into space. It's used to good effect here. For example, for the AR version of one tower in the game, you can turn your camera around it to see it from different perspective, and if you look closely through the windows you can see things moving inside. Very cool. Same with the page on the character designs where the characters will pop up and you can see them move. There are only four AR models in the book. Also included in the book is a coupon code to download the soundtrack of the game via the PlayStation Network. Journey: Official Game Soundtrack cost over ten dollars by itself. This is a marvelous artbook, even if it is rather pricey. 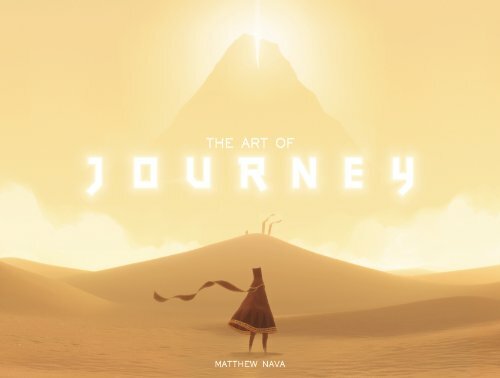 The Art of Journey is available on Amazon.com. It's a good book, but slightly overpriced. Too bad i don't have any tablets!! Thank you for the video it's stunning I wasn't expected something like that. I hope in the future that there will be more book with this kind of thing!! A simply incredible quality art book to, in my mind, the most perfect game ever created (besides the Team Ico titles that is..) thatgamecompany needs our full support more than any other, so we can continue to be gifted with these kinds of amazing creations. I've already downloaded the title, bought the physical Collector's Edition, art book, & the flOw Flower & Journey trilogy prints. & by the way, the incredibly composed score by Austin Wintory is fully worth the purchase itself.. This is an amazing book. It gives you an insight into what went on behind the scenes in making the stunning art work of Journey. As mentioned, the AR viewer is an added bonus. It's a very unique feature that I've not seen implemented before. Also the soundtrack (Composed by Austin Wintory) that comes with this as a download is just as breathtaking. You will not be disappointed! Would love to have purchased this book - unfortunately it's out of print now and unlikely to be available again. Bluecanvas has released the 2nd edition.